Take a Little Michigan Home with You! 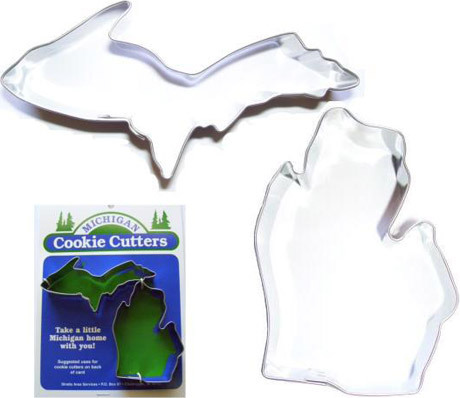 Our Michigan Cookie Cutters are hand crafted right here in Northern Michigan! Everything from the cutting and rolling of the steel to the spot welding is all done right here at Straits Area Services. These cookies cutters are made of durable stainless steel, they make a great gift idea and the kids will love them! Order yours now by clicking the Buy Now button below or call us for Wholesale pricing. Note: Each Cookie Cutter sold helps employ 7 Developmentally Disabled adults. Each Cookie Cutter is only $5.95 + S&H. Contact Christina Beethem, Production Foreman, at (231) 627-4319 ext. 22 or toll-free at 1-877-627-8200 for more info. The Lower Peninsula measures 3.5” x 2.25” and the Upper Peninsula measures 4.25” x 1.5”. Paying by check or money order? Click here!